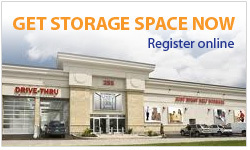 Our self-storage centre is perfect for home and business use. Just Right Self Storage is conveniently located in Ottawa’s city core, minutes away from the Parliament Buildings. We offer more than 1,100 climate-controlled storage units ranging from 25 to 300 square feet. Our drive-thru bay ensures that you unload your belongings in comfort, completely sheltered from the weather. A free truck: We’ll drop it off when you’re ready to load up. Free carts and dolies: Even though you can park just steps away from your storage unit, you may find these helpful to move your cargo. Storage Insurance: Our optional coverage may be more convenent than adding your storage unit to your existing homeowner’s or tenant’s insurance policy. Moving Supplies: Need boxes and packing tape? Moving supplies and bubble wrap? We’ve got that, too!